Tom Pohrt spent years gathering those poems of Wendell Berry’s he imagined children might read and appreciate, making sketches to accompany his selection. Over the past several years a dialogue has evolved in which the poet has come to advise the illustrator on the natural history of the animals and plants seen so intimately in the poems. Then came the august book designer Dave Bullen, who has been designing the books of Wendell Berry for more than thirty years. The resulting volume of 21 poems includes dozens of the sketches, drawings and watercolors in what amounts to a visual meditation on the poem they work to illustrate and is simply staggering in both its beauty and its meaning to those of us who remain lovers of the book as physical object. 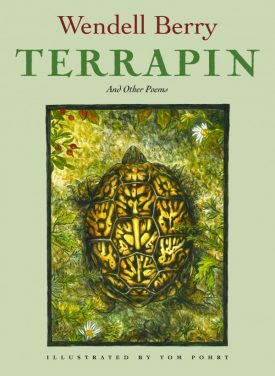 In the full-color Terrapin we have not only a volume of staggering beauty but a consummate example of the collaborative effort that is fine bookmaking, the perfect gift for children, grandchildren or anyone who remains a lover of the book as physical object. TOM POHRT is a self-taught artist and illustrator and has published in eighteen books and various journals. Since 1999, he has traveled extensively in Cuba, where he and his wife were married in her hometown of Ciego de Avila. They lives with their daughter in Ann Arbor.